Bombay film music orchestra for hire. The Bombay Gold Orchestra is the brainchild of Kuljit Bhamra and Hazel Correa and is the only ensemble of its kind in the UK performing Bombay film songs with voice, strings and percussion. A beautiful blend of spicy strings, bollywood beats and soulful songs. One of the main features of Bombay film music is the soaring sound of the violins. Many Bollywood bands recreate this using electronic keyboards and synthesisers. Members of the ‘Bombay Gold Orchestra’ are talented composers and music arrangers in their own right and have spent considerable time recreating and writing out the music in order to create the authentic Bollywood sound for live strings. Many of these string arrangements have been made possible by Adrian Smith and Jane Browne – and it is this that gives the ‘Bombay Gold Orchestra’ it’s own unique sound. Kuljit Bhamra is recognised as the most inspiring and influential musician, composer and record producer on the British Asian music scene. Spearhead of the Bhangra movement, Kuljit has composed and produced over 2000 songs and is responsible for the rise to fame of numerous Bhangra and Bollywood stars. His 1989 bhangra hit ‘Rail Gaddi’ is played at weddings even today. 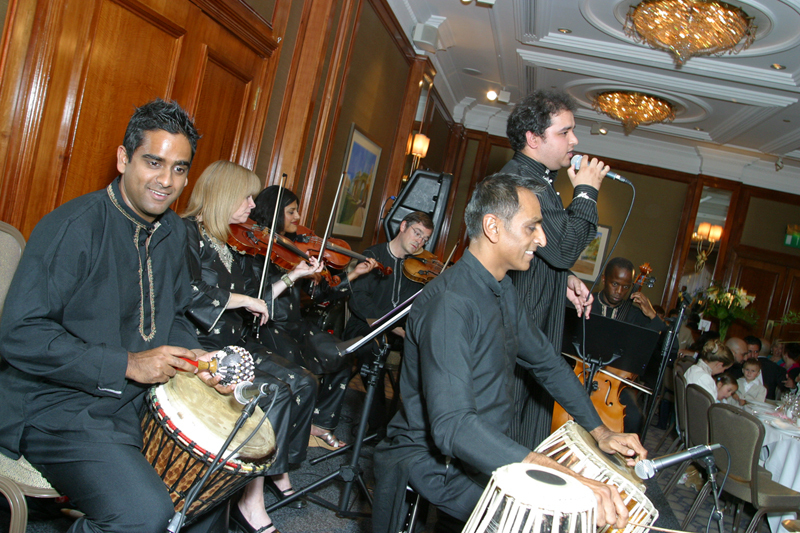 Away from the record-producing scene, Kuljit has worked, both independently and collaboratively, on film scores for 10 years, including the soundtrack for the award winning Bhaji on the Beach, Bend it like Beckham, and appearances on The Guru, The Four Feathers and more recently Alexander, Charlie & The Chocolate Factory and Brick Lane. He also worked on Andrew Lloyd Webber’s massive hit musical ‘Bombay Dreams’, for which he gave a truly breath-taking performance as on-stage percussionist. The London Asian Guardian describes Kuljit as ‘One of the most prolific and dedicated Asian music producers to come out of Britain’. Hazel Correa is one of the very few British Asian violinists in the UK. A talented and versatile musician whose busy and varied career involves working with many symphony and chamber orchestras, as well as diverse projects including the Reggae Philharmonic Orchestra, Hot Strings – an all female classical cabaret act, and collaborations with saxophonist Courtney Pine. She has backed many pop music acts in a variety of settings including the Prince’s Trust 30th birthday concert at the Tower of London in 2006. Hazel is a member of Ku Da Mix; an 18 piece multi-cultural collective who made their debut at Scala in 2004 to great critical acclaim. A committed teacher and tutor, she also conducts and coaches a children’s string orchestra in Harrow and teaches violin. In 2000, Hazel spent 6 months teaching music and English at Kathmandu University Preparatory School, Nepal.